Last week, we introduced some unique items on the menu at U.S. hamburger chain restaurants in Japan. See U.S. hamburger chain restaurants offer some unusual items in Japan. 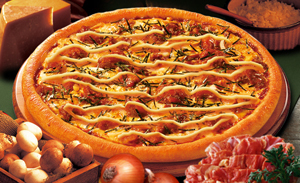 This week, GaijinPot looks at unique items on the Japan menus of American pizza delivery brands Domino’s Pizza and Pizza Hut. Basil Shrimp is one of the Buon appetito series. It has an ultra crispy crust, cut in squares. Its sauces are basil and pomodoro, while the toppings are shrimp, garlic and parmesan cheese. 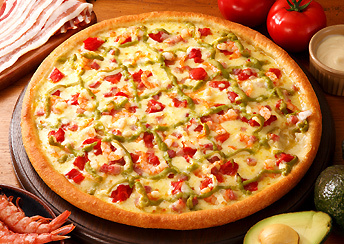 Avocado Shrimp is part of the regular menu of Domino’s Pizza in Japan and features tomato, pancetta, shrimp and mayonnaise and avocado sauce. The creamy avocado sauce and mayonnaise really match the shrimp. Especially recommended for avocado lovers. 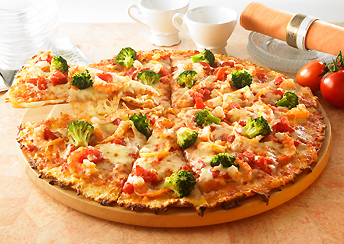 Lasagna Pizza, which is also a regular menu item, is combination of lasagna and pizza which are traditional Italian foods. Its sauces are Bolognese and white sauce. Toppings are Bolognese sauce, potato, parsley flakes, and parmesan cheese. This pizza has a very rich taste. Charcoal Grilled Chiki-Teri is popular regular menu item. 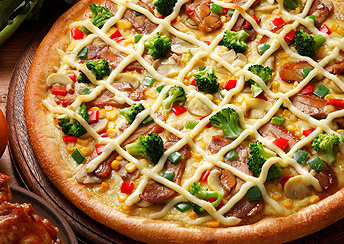 Featuring tomato sauce, its toppings are onion, mushroom, corn, teriyaki chicken, broccoli, paprika and mayonnaise. Charcoal grilled chicken is juicy and matches the mayonnaise (which is an optional item). 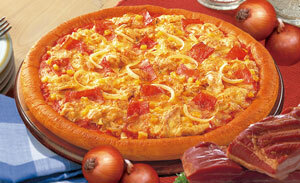 Mayo Jaga is made with tomato sauce and its toppings are onion, corn, potato, pancetta, paprika and mayonnaise. The taste of potato and baked mayonnaise is very popular with customers. It is brightly decorated, making it fun to look at too. 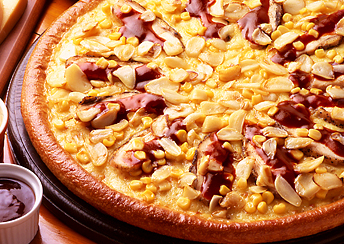 BBQ Garlic Chicken’s toppings are onion, roasted chicken, BBQ sauce, corn and garlic. The rich BBQ sauce enhances the taste of the roasted chicken. Camembert Mille-Feuille Shrimp uses a crispy Camembert Mille-Feuille crust with a tomato sauce base. 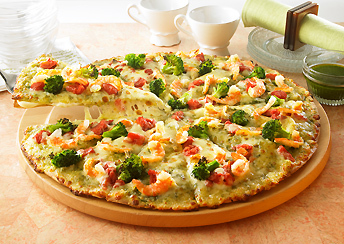 Toppings are tomato, shrimp and broccoli. The many shrimp and rich camembert cheese make it a popular item. Also, there is Camembert Mille-Feuille Shrimp which uses basil sauce instead of tomato sauce. Pote Mayo Sausage is a temporary menu item for April. 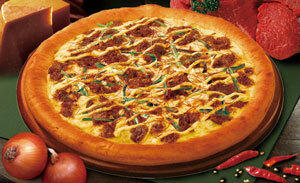 Its sauce and toppings are tomato sauce, mayonnaise, potato, corn, bacon, sliced sausage and parsley. 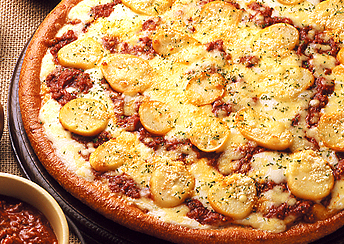 The sausage, bacon and potatoes come from Hokkaido. It is a tasty and big volume pizza. Teriyaki Chicken is a regular menu item. 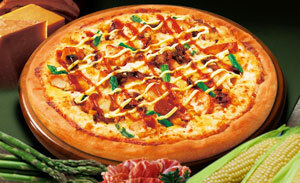 Its sauce and toppings are mushroom mix, asparagus, teriyaki chicken, teriyaki sauce, mayonnaise and corn. 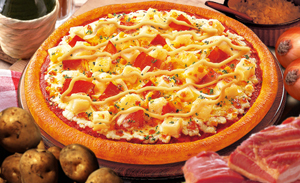 Seafood Mix is one of the most popular Pizza Hut items in Japan. 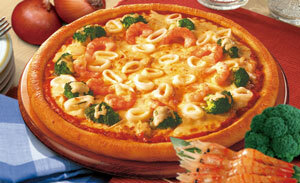 Its toppings are big shrimp, squid, tuna with mayonnaise, broccoli and onion. The combination of seafood and vegetables creates a rich taste. Super Korean Purukogi’s toppings are garlic chive, pepper, mayonnaise, purukogi and onion. Purukogi is a Korean dish of barbecued meat. 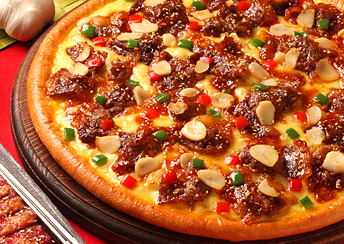 The barbecued meat with sweet and spicy sauce, garlic chive and onion, is full of energy. 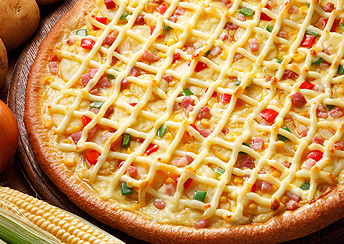 Mayo Q’s toppings are sliced nori, mayonnaise, corn, barbecued chicken, mushrooms and onion. The combination of mayonnaise, barbecued chicken and sweet spicy sauce make it very tasty. 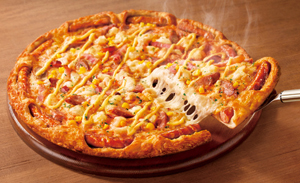 Idaho Special’s toppings are parsley, mayonnaise, black pepper, corn, diced potato, bacon and onion. It is a mild tasting pizza. Tuna Mild has corn, bacon, tuna with mayonnaise, and onion. So, have you tried any of the pizzas above? If you have, let us know what you think. 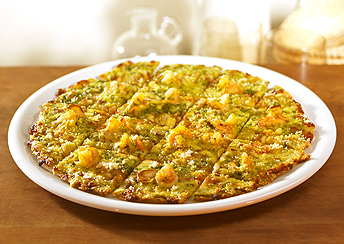 Avocado, nori and mayo… the classical combination for Japanese pizza… I’m a little intrigued by the Korean-flavoured ones!